Apep (Apophis, Apopis) A serpent God embodying the primeval forces of disorder inimical to life. Apophis is the eternal opponent of Re and attacks the solar boat, not only during its nocturnal journey, but even during its journey by day. He is conceived as massive in size (his name is sometimes interpreted with reference to Coptic oipe/ôipi/aipi as meaning huge or indeterminate in size, Wörterbuch 1: 67) and possessing a deafening roar and paralyzing gaze. Many different deities are said to assist Re in fighting off Apophis, but pre-eminent among them is Seth, in his principal beneficent function. The vigor and vitality of Seth, disruptive on one level, is nevertheless apparently uniquely suited to combat the entropic assault of Apophis. The role of Seth in this drama underscores the distinction between the spheres in which the conflicts associated with Re and those associated with Osiris are situated. This is vividly illustrated in the depictions of the seventh hour of the night in the Amduat book, the book of “That Which is in the Duat,” or netherworld. The hour is depicted, as is the form in this book, in three registers. In the middle register, the boat of Re confronts Apophis, who has swallowed up the water which the boat needs to proceed. At the head of the boat stand Isis and Seth, whose exercise of magic (heka in Egyptian) wards off Apophis and permits the boat to proceed despite the lack of water. The cooperation of Isis and Seth here stands in stark contrast to the conflict between them in the Osirian mythos. Meanwhile, Apophis is fettered by the Goddess Serket while others hack his body to pieces. In the upper register Osiris is enthroned. Like Re in his boat, Osiris is encircled by the protective serpent Mehen, for the first time in the book in this hour, as if the beneficent counterpart of Apophis. Before Osiris are a series of bound captives, his own enemies, depicted in human form, who are being decapitated by a demon with a cat’s head, evoking spell 17 of the Book of the Dead in which Re (or alternately Shu) in the form of a cat uses a knife to decapitate a serpent (identified with Apophis) who is coiled around the sacred sycamore or persea tree in Heliopolis. In the lower register, a peaceful procession of stars proceeds toward the eastern horizon, either untouched by the conflict in the two parallel domains or their status secured by the overcoming of Apophis. The magic which is performed in this hour is said in the text to be performed likewise on earth, and “who performs it, is present in the barque of Re, in heaven and in earth,” (p. 93 in Abt & Hornung 2003). Humans thus while alive can and do participate in the drama of overcoming Apophis, and we have evidence of such rites directed against Apophis, especially from a collection known as The Book of Overthrowing Apophis, in which names and forms of Apophis written on papyrus or wax figures of Apophis are destroyed. In the sixth hour of the Book of Gates, another New Kingdom depiction of Re’s nocturnal journey, the heads of those Apophis has swallowed are depicted rising up out of his body in the upper register, paralleling a series of mummified corpses in the lower register which lie atop a serpent-shaped bed, while the boat of Re passes through in the middle register. Those who have been consumed by Apophis are thus able to regain their forms through the grace of Re. The same sort of scene depicted in the seventh hour of the Amduat book is narrated in spells 39 and 108 of the Book of the Dead. In 39 we note that Isis is said to dismember Apophis, evoking the dismemberment by Seth of Isis’ brother and consort Osiris. In 108 Seth hurls a spear of iron against Apophis, causing him to disgorge the water he has swallowed, which has brought the boat of Re to a halt, not in the middle of the night, as in the Amduat book, but just after midday. This victory, as ever only a temporary one, allows Re to set in safety. Apophis can never be wholly eliminated insofar as the forces of entropy are an implicit part of the cosmos. Thus just as Osiris is dismembered but reconstituted, expressing the salvation of the mortal being, so the very Goddess who reconstitutes Osiris, namely Isis, dismembers Apophis who nevertheless reconstitutes himself. Other Names: Apophis, the Destroyer. Patron of: evil and darkness. Appearance: a great serpent or crocodile. 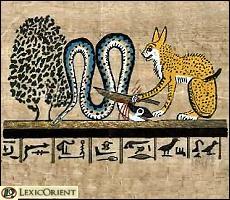 Description: Apep was the ancient spirit of evil and destruction who dwelled in eternal darkness. Every day he would attempt to devour the Sun Boat of Ra as it sailed the heavens. Set‘s original role was to battle Apep and keep him from destroying the boat. Occasionally, Apep would succeed, and the world would be plunged into darkness (a solar eclipse?). But Set and his companion Mehen would cut a hole in Apep’s belly to allow the Sun Boat to escape. Apep commanded an army of demons that plagued mankind. Only by putting faith in the gods of light could people defeat the demons. Every year, a ritual called the “Banishing of Apep” would be held by the priests of Ra. They would take an effigy of Apep and in the center of the temple they would pray that all the wickedness in Egypt would go into the effigy. Then they would trample the effigy, crush it, beat it with sticks, pour mud on it, and eventually burn and destroy it. In this way, the power of Apep would be curtailed for another year. In Egyptian mythology, Apep (also spelled Apepi, and Aapep, or Apophis in Greek) was an evil god, the deification of darkness and chaos (isfet in Egyptian), and thus opponent of light and Ma’at (order/truth), whose existence was believed from the Middle Kingdom onwards. His name is reconstructed by Egyptologists as *ʻAʼpāpī, as it was written ꜥꜣpp(y) and survived in later Coptic as Aphōph. Apep formed part of the more complex cosmic system resulting from the identification of Ra as Atum, i.e. the creation of Atum-Ra, and the subsequent merging of the Ogdoad and Ennead systems. Consequently, since Atum-Ra, who was later referred to simply as Ra, was the solar deity, bringer of light, and thus the upholder of Ma’at, Apep was viewed as the greatest enemy of Ra, and thus was given the title Enemy of Ra. 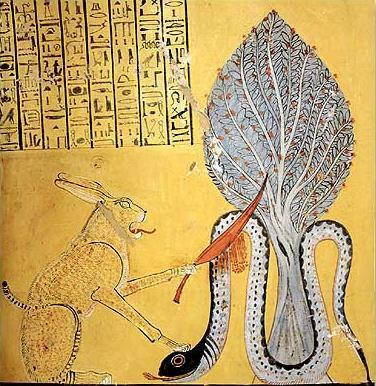 As the personification of all that was evil, Apep was seen as a giant snake/serpent, crocodile, or occasionally as a dragon in later years, leading to such titles as Serpent from the Nile and Evil Lizard. Some elaborations even said that he stretched 16 yards in length and had a head made of flint. It is to be noted that already on a Naqada I (ca. 4000 BCE) C-ware bowl (now in Cairo) a snake was painted on the inside rim combined with other desert and aquatic animals as a possible enemy of a (solar?) deity who is invisibly hunting in a big rowing vessel. Also, comparable hostile snakes as enemies of the sun god existed under other names (in the Pyramid Texts and Coffin Texts) already before the name Apep occurred. The etymology of his name (’3pp) is perhaps to be sought in some west-semitic language where a word root ‘pp meaning ‘to slither’ existed. A verb root ’3pp does at any rate not exist elsewhere in Ancient Egyptian. (It is not to be confused with the verb ‘pi/’pp: ‘to fly across the sky, to travel’) Apep’s name much later came to be falsely connected etymologically in Egyptian with a different root meaning (he who was) spat out; the Romans referred to Apep by this translation of his name. After the end of the Middle Kingdom, the foreign Hyksos, now rulers over Egypt, chose Set as their favorite deity, since he had been protector of Ra, and was associated with Lower Egypt, where their power base was. Consequently, because the foreign overlords were hated by nationalistic groups, Set became gradually demonised, and started being thought of as an evil god. Indeed, because of the extreme level of nationalism and xenophobia, Set eventually became thought of as the god of evil, and gradually took on all the characteristics of Apep. Consequently, Apep’s identity was eventually entirely subsumed by that of Set. Tales of Apep’s battles against Ra were elaborated during the New Kingdom. Since nearly everyone can see that the sun is not attacked by a giant snake during the day, every day, storytellers said that Apep must lie just below the horizon. This appropriately made him a part of the underworld. In some stories Apep waited for Ra in a western mountain called Bakhu, where the sun set, and in others Apep lurked just before dawn, in the Tenth region of the Night. The wide range of Apep’s possible location gained him the title World Encircler. It was thought that his terrifying roar would cause the underworld to rumble. Myths sometimes say that Apep was trapped there, because he had been the previous chief god and suffered a coup d’etat by Ra, or because he was evil and had been imprisoned. In his battles, Apep was thought to use a magical gaze to hypnotize Ra and his entourage, attempting to devour them whilst choking the river on which they travelled through the underworld with his coils. Sometimes Apep had assistance from other demons, named Sek and Mot. Ra was assisted by a number of defenders who travelled with him, the most powerful being Set, who sat at the helm. In a bid to explain certain natural phenomena it was said that occasionally Apep got the upper hand. The damage to order caused thunderstorms and earthquakes. Indeed: it was even thought that sometimes Apep actually managed to swallow Ra during the day, causing a solar eclipse, but since Ra’s defenders quickly cut him free of Apep, the eclipse always ended within a few minutes. On the occasions when Apep was said to have been killed, he was able to return each night (since he lived in the world of the dead already). In Atenism it is Aten who kills the monster since Aten is the only god in the belief system. But in other myths, it was the cat goddess Bast, daughter of Ra, who slayed Apep in her cat form one night, hunting him down with her all seeing eye. Apep was not so much worshipped, as worshipped against. His defeat each night, in favour of Ra, was thought to be ensured by the prayers of the Egyptian priests and worshipers at temples. The Egyptians practiced a number of rituals and superstitions that were thought to ward off Apep, and aid Ra to continue his journey across the sky. In an annual rite, called the Banishing of Apep, priests would build an effigy of Apep that was thought to contain all of the evil and darkness in Egypt, and burn it to protect everyone from Apep’s influence for another year, in a similar manner to modern rituals such as Zozobra. In addition to stories about Apep’s defeats, this guide had instructions for making wax models, or small drawings, of the serpent, which would be spat on, mutilated and burnt, whilst reciting spells that would aid Ra. Fearing that even the image of Apep could give power to the demon, any rendering would always include another deity to subdue the monster, and/or knives already stabbed into him. 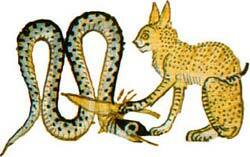 As Apep was thought to live in the underworld, he was sometimes thought of as an Eater-up of Souls. Thus the dead also needed protection, so they were sometimes buried with spells that could destroy Apep. 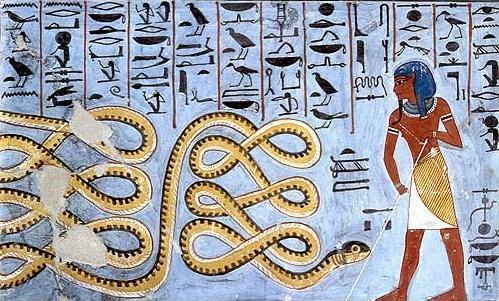 The Book of the Dead does not frequently describe occasions when Ra defeated the chaos snake explicitly called Apep. Only BD Spells 7 and 39 can be explained as such.